Beat the eggs in a bowl wit a pinch of salt and pepper. Cut truffles into slices, chop the caciotta into little cubes and trite the walnut kernels. 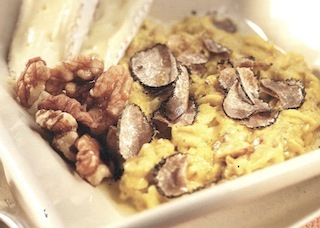 - Pour the eggs in a pan with a bit of melted butter whisking; then add the caciotta, half of the truffles and walnuts. - Remove from fire and keep on whisking to melt the cheese and make the mixture creamy and stringy. 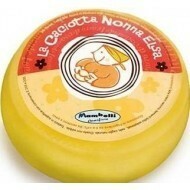 - Serve the scramled eggs finishing with truffle slices and, to taste, add walnuts kernels and 2 thin slices of Caciotta Nonna Elsa.